Use these tips to ensure your next exterior paint project goes smoothly! If you’re interested in increasing the curb appeal of your home, consider an exterior painting project. Liven up a dulling color or completely change the look of your home with a fresh coat of paint. Before you get started, here are some tips to remember for your project. 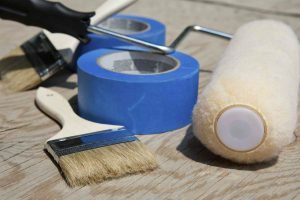 Preparing for your exterior painting project means ensuring that you have all the tools and accessories you need to complete the project. Make a checklist to keep handy and take all the necessary measures to protect your windows, landscaping, and anywhere else you don’t intend to paint. Get the surface of your home ready for painting by washing it to ensure that its clear of dirt or any other grime that you wouldn’t want impacting the smooth texture of your finished job. Scrape or sand the existing paint to get the surface as smooth as possible. Just as important as your technique for painting is your paint and color choice. Since this is for the exterior of your home, your choice should be weather resistant. The impact of the sun, rain, and other environmental factors can cause fading over time. The paint you choose should be fade- and UV-resistant, and durable for a long-lasting life. In terms of color, consider the style of the homes in your neighborhood. Choose a color and tone that will complement your neighbors and provide a cohesive look for the area while maintaining your unique sense of style. Also, consider the other exterior elements of your home and coordinating your color choice with those features. The best way to approach your exterior painting project is to start at the top of your home and work your way down. Cloudy, overcast days will be your friend as hot surfaces and surfaces under direct sunlight will cause the paint to dry too quickly and increase the possibility of premature flaking. Using a combination of a brush and roller will help you complete the task in the most effectively, using the brush for narrow edges and smaller areas, and the roller for long, flat surfaces.